HARRISBURG – Gov. 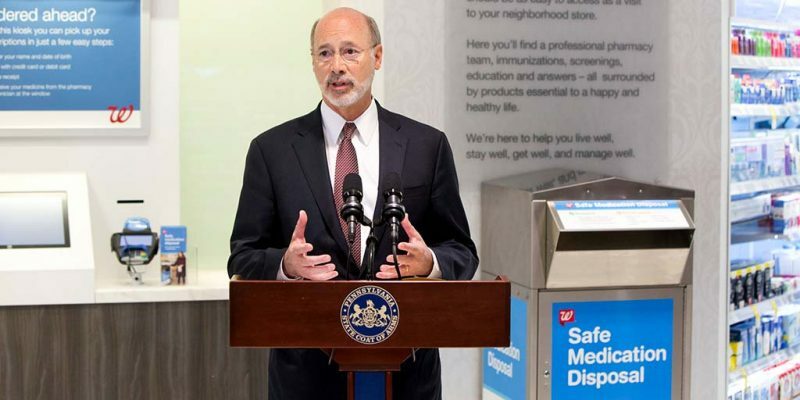 Tom Wolf is reminding Pennsylvanians that amid his continued heroin and opioid disaster declaration, disposing of old, unneeded or expired prescriptions can help decrease access to powerful opioids and other prescription drugs. Saturday, April 28 is the 15th National Prescription Drug Take-Back Day and Wolf encouraged anyone needing to dispose of prescription medications to safely dispose of the drugs at one of the nearly 700 drug take-back boxes around the commonwealth. “The opioid and heroin crisis has hit Pennsylvania hard and this crisis doesn’t discriminate – it hits every age group, every creed, color and income level,” Wolf said. National Drug Take-Back Days are held twice annually by the Drug Enforcement Agency (DEA) and state and local partners to encourage people to take an active role in making their homes and communities safe and lowering the risk of prescription drug misuse. Nearly 37,000 pounds of old or unnecessary prescription drugs were collected in Pennsylvania during the October of 2017 take-back day. To date, nearly 400,000 pounds of prescription drugs have been safely disposed of at Pennsylvania’s take-back boxes since 2014. “Prescription drug misuse is a major catalyst for the heroin and opioid epidemic that we are fighting every day, and too many people with an opioid use disorder obtain medicine from family and friends’ medicine cabinets,” said Pennsylvania Department of Drug and Alcohol Programs Secretary Jennifer Smith. Prescription drug take-back boxes can be found in Pennsylvania State Police barracks, local police stations and municipal buildings and pharmacies around Pennsylvania. A map of take-back box locations searchable by county and zip code can be found on the Department of Drug and Alcohol Programs’ Web site. “Drug Take-Back Day is an opportunity to get rid of unused prescription drugs and prevent drug addiction and overdose deaths,” Secretary of Health Dr. Rachel Levine said. For more information on the opioid crisis in Pennsylvania, visit www.pa.gov/opioids.